Nanotechnologies are among the great technological advances of recent times. They designate all the techniques used to manufacture and manipulate matter on an infinitesimal or nanometric scale, and they have spawned the development of everyday products across a broad spectrum of sectors, from the pharmaceutical industry to electronics and from aeronautics to chemistry. The fields of application for nanotechnologies are immense in scope and will continue to grow as these technologies evolve. Current research, which revolves largely around advanced materials, is paving the way for the development of nanomaterials, which are natural materials containing free particles, with at least one nanoscale dimension. Several types of nanomaterials (nanoparticles, nanocomposites, carbon nanotube, nanostructured materials, etc.) 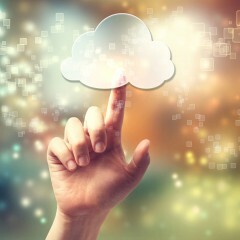 are under study in current research and development fields. 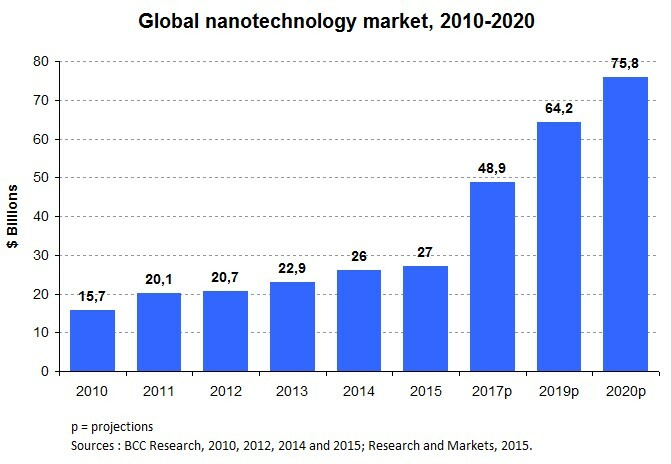 According to recent estimates, nanomaterials accounted for 73% of the nanotechnologies market in 2015, with this figure expected to rise to 82% by 2019. Nanomaterials hold potential across a seemingly infinite array of fields (i.e., chemistry, biology, mechanics, optical technologies, etc. ), and growing interest in nanomaterials research has fuelled the development of important new applications, particularly in the environmental and energy sectors. Nanomaterials are now used to implement effective and inexpensive technologies for converting and storing energy. They are the driving force behind the development of higher performance batteries, mainly for use in transportation and electronics. In the environmental sector, nanomaterials are spurring the development of innovative processes aimed at mitigating the risks associated with various industrial activities. In particular, they offer timely and effective solutions for use in soil remediation and waste water treatment. Owing to their physicochemical characteristics, nanomaterials have a great capacity to absorb pollutants. This article sets out to explain how nanotechnologies (and nanomaterials) are contributing to the development of alternative environmental and energy technologies. Nanotechnologies constitute a promising field, thanks to their potential for reducing our dependence on fossil fuels and curbing the effects associated with the massive use of products that are harmful to the environment. After a brief overview of the scale of the nanotechnologies market in the environmental and energy sectors, we will turn our attention to recent technological developments spurred by the use of nanomaterials. The focus, in this case, will be on technologies giving rise to new business sectors, notably in energy conversion and storage, and soil remediation. 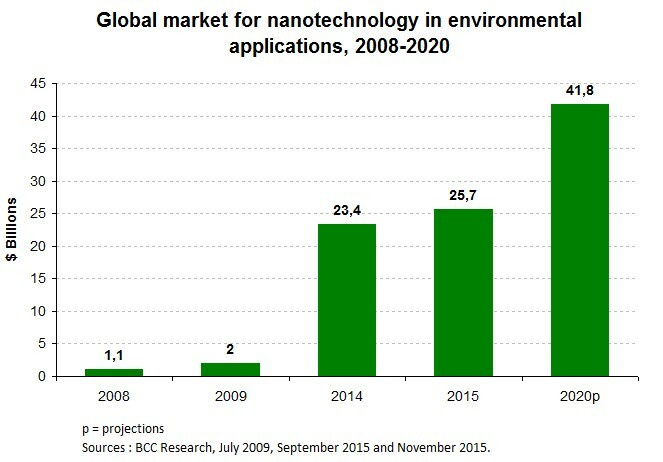 The global market for nanotechnologies is about to explode. Pegged at about $16 billion in 2010, its market value rose to an estimated $27 billion in 2015—an average annual growth rate of 11.5% during that five-year period. Even more rapid growth is projected in the years to come, with the market expected to reach a value of $76 billion by 2020, which is equivalent to an average annual growth rate of 23% from 2015 to 2020. This strong growth may be attributed, in large part, to the growth in the use of nanomaterials. In 2010, nanomaterials accounted for 64% of this industry, and that share is expected to reach 82% by 2019. The nanotechnologies (and thus nanomaterials) market holds great promise for the environmental and energy sectors. The market for environmental applications was estimated to be in the order of $1.1 billion in 2008. In 2015, the same market was pegged at $26 billion, an average annual increase of 57% over seven years. Environmental applications in the nanotechnologies market are expected to grow at an annual rate of 10% between 2015 and 2020, to reach $42 billion by 2020. Growth has been observed across all environmental sub-sectors. By 2020, the markets for nanotechnologies applied to waste water and air pollution treatment are expected to reach $16.6 billion and $16.7 billion, respectively, which is equivalent to annual growth rates of 12.5% (waste water) and 10% (air pollution) between 2015 and 2020. 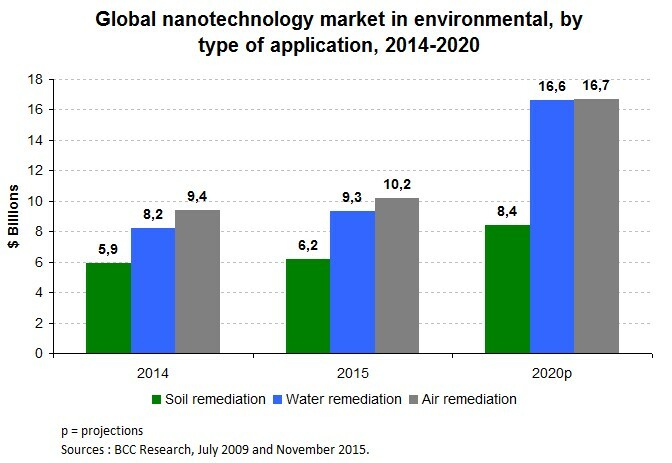 In terms of soil remediation, the nanotech market was valued at $6 billion in 2015, and that figure is expected to rise to $8.4 billion by 2020, for an annual growth rate of 6%. Nanotechnologies also represent a growth market in the energy sector, driven mainly by new energy storage and conversion technologies. In 2012, the market held an estimated value of $8.8 billion, and it is expected to grow at an annual rate of 11%, to reach $15 billion by 2017. The development of new materials used to make safer, more efficient and inexpensive lithium-ion batteries is a prime example of how nanomaterials are applied in the energy sector. In 2010, the global market for nanomaterials used for energy storage in lithium-ion batteries was estimated at $63 million, and it is expected to grow by an average annual rate of 37%, to reach $575 million by 2017. Nanomaterials are the object of countless research studies aimed at producing ever more innovative technologies for use in the environmental and energy sectors. By promoting a healthier environment and improved energy efficiency, these innovations are driving development in emerging fields, including electric vehicles, clean-energy buildings, and cutting-edge soil remediation. The recent technology developed by Professor Subhasis Ghoshal constitutes a significant advance in the use of nanotechnologies for soil and water remediation, with a high potential for industrial applications. With his team, the director of McGill University’s Trottier Institute for Sustainability in Engineering and Design (TISED) has perfected a solution using iron nanoparticles. These particles are non-toxic, highly reactive and very effective (easy contact with contaminants) in quickly depolluting soil contaminated with organic substances. 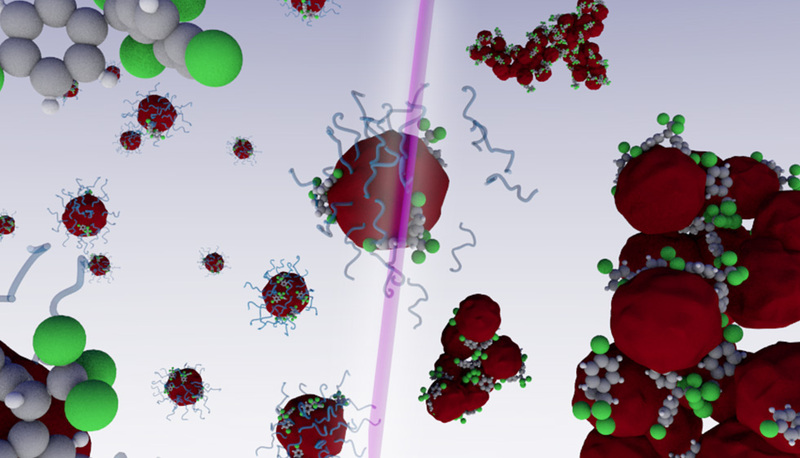 The iron nanoparticles developed make it possible, at one and the same time, to decontaminate soil and treat liquid industrial waste upstream before it is released into the environment. More specifically, these nanoparticles are effective in treating chlorinated hydrocarbons and heavy metals—both of which are toxic chemical products. In order to decontaminate a site, the nanoparticles are first injected into the soil, where they react with the contaminants absorbed into the soil and groundwater. Treating industrial waste containing chlorinated solvents – which is currently done by incineration – could instead be done on site (without the need to transport waste), in a reactor filled with nanoparticles. The products released from the reactor are harmless, and they contain ethylene, a chemical product that may be useful in other industries, such as plastics manufacturing. While the initial process has already produced conclusive results, the researcher has added biodegradable polymers, sulfide (a chemical compound) and butanol (a type of alcohol) in a bid to increase decontamination speed and thus improve it. Polymers have the capacity to stabilize and better distribute nanoparticles in groundwater or industrial waste water, while sulfide makes the particles more reactive. A novel reactor treatment process was developed, whereby the butanol solution was used to allow reactions in a “dry” environment (less water), a process that helps break down chlorinated hydrocarbons more rapidly. Compared to nanoparticles without butanol and biodegradable polymers, the degree of soil decontamination is 50% higher with optimized nanoparticles. What’s more, rapid decontamination prevents the nanoparticles from rusting, which would render this method ineffective. This technology holds promise for several industries in the environmental, clean-tech and manufacturing sectors. As part of his postdoctoral research at the Massachusetts Institute of Technology (MIT), Professor Nicolas Bertrand of Université Laval has developed a technology to remove soil and water contaminants using nanoparticles made from biodegradable polymers. The latter have the specificity of being sensitive to light. These polymer nanoparticles capable of effectively absorbing organic contaminants (e.g., pesticides, pharmaceutical products, plastic pollutants.) have been successfully lab-tested on more than 22 types of pollutants present in the soil and water. This innovative technique is deployed in several stages. First, the contact between the nanoparticles and the contaminated surface serves to absorb and retain the contaminants present in the soil. Once extracted and exposed to ultraviolet radiation, the contaminated nanoparticles aggregate to form a solid residue, which can be recovered by means of filtration. This concentrated residue can then be destroyed more effectively, with the result that the nanoparticles are not released into the environment. According to the researcher – who intends to pursue his work on similar technologies – this promising technique has the potential to improve the processes currently used. Companies from the United States, Quebec and France have already expressed interest, although the manufacturing processes must still be optimized so that the technology can be tested on a larger scale. The research led by Professor Oumarou Savadogo at the Laboratory of New Materials for Energy and Electrochemistry has resulted in the development of a technology that uses electrochemistry to decontaminate waste water and sewage sludge. This lab-tested technology relies upon electrical energy to degrade or extract contaminants, and it can be applied to deal with both organic and inorganic contamination. By immersing two nanomaterials (electrodes) in the contaminated environment and introducing a current between them, Savadogo and his team successfully extracted the contaminants from the waste water and sewage sludge. One of the specificities of this technology is that it simultaneously extracts hydrocarbons and metals, in the event of a mixed contamination (organic and inorganic contaminants). The researcher maintains that the process developed initially for waste water and sewage sludge could also be applied to soil treatment, by using the proper electrical equipment. These promising technologies also stand to benefit from the know-how of local companies, which have the kind of complimentary expertise likely to spawn collaborations between research and industry. Such is the case with Pangeos, a company that has integrated recent scientific advances into its contaminated site characterization and rehabilitation services in order to provide more accurate site assessment and in turn optimize decision-making. The company thus has the expertise to carry out real-time analyses of contaminants on site, in contrast to conventional techniques, which require that samples be sent to labs, with a corresponding wait time of a few days before the test results become available. With this expertise, Pangeos, in a matter of minutes, uses portable analyzers to determine the type and depth of contamination directly on-site. This solution optimizes decision-making by making it possible to more accurately mark off the contaminated areas. It also decreases wait times and lowers the costs normally associated with the characterization or rehabilitation of contaminated sites. 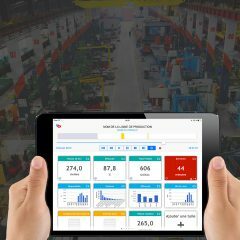 In order to integrate the most recent technological developments associated with this expertise, the company will make a cloud-computing tool available to its clients for purposes of real-time data sharing and decision-making. Through its research and development activities, Pangeos is collaborating with various Quebec universities, including the École de technologie supérieure, which houses the Canada Research Chair in Characterization of Contaminated Sites. These diverse collaborations have allowed the company to put forward innovative new concepts, notably for use in contaminated soil remediation, high-resolution characterization and rehabilitation of contaminated sites, and the representativeness of environmental data. Professor Daniel Bélanger, holder of the New Materials Research Chair in Energy Technologies at the Université du Québec à Montréal (UQAM), is conducting research on nanomaterials used to convert and store energy. In collaboration with the Natural Sciences and Engineering Research Council of Canada (NSERCC) and the Institut de recherche d’Hydro-Québec (IREQ), Bélanger and his research team recently achieved important advances that make it possible to improve the efficiency of lithium-ion batteries. By adding a nanofilm to the surface of electrode-active materials, these batteries show improved performance (amount of energy and speed of recovery) and stability (battery life, safety). Successfully lab-tested, this invention could potentially be used by companies seeking to develop energy storage systems, mainly for electric vehicles. Professor Steen B. Schougaard, director of the Research Centre on Nanomaterials and Energy (NanoQam), in collaboration with the company Phostech Lithium, which has become Johnson Matthey Battery Materials Ltd, has developed composite materials for use in high-performance lithium-ion batteries. By adding an electrically conductive polymer that coats the nanoparticles contained in the lithium-ion batteries, he obtained a material that allows these batteries to store and draw energy more rapidly from renewable sources such as wind, solar and hydro. In other words, the energy stored in the batteries is not only green, but the battery charging time is also minimized. The advantages of this leading-edge research for Canada, and particularly for Quebec, are enormous. The technology developed will not only benefit the emerging market for hybrid and electric vehicles, but it also lends itself to the use of hydroelectric resources – which are in abundant supply in Quebec – to reduce our environmental footprint and resolve the problem of energy intermittency. Holder of the Canada Research Chair in Nano and Hybrid Materials at the École Polytechnique de Montréal, Professor Oussama Moutanabbir develops new multifunctional materials, such as semiconductors made from silicium-germanium-tin alloys. These semiconductors can be used in the production of clean energy, and they can also serve as basic units for reducing the amount of energy consumed by electronic equipment and communications tools. More specifically, the researcher and his team are developing nanoscale lasers that can be integrated into silicon chips in order to obtain low-power, ultra high-efficiency chips. The technologies behind these new light sources can also serve to develop innovative devices, such as infrared imaging systems, light-emitting diodes, and photodetectors that operate over wavelengths from near-infrared to mid-infrared (light not visible to the naked eye). These technologies can have applications in security and surveillance, environmental inspection, anti-counterfeiting, advanced biomedical testing, smart vehicles, and the detection of organic contaminants, notably in food products. 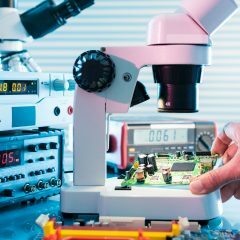 In a context where objects are increasingly connected, the materials developed are also capable of improving connectivity between communications tools as well as their energy efficiency, according to the researcher. What’s more, these nanomaterials can be applied in photovoltaics, to convert energy into electricity. The scientific issues raised by this new family of materials and their technological implications have sparked interest among several American, European, Canadian and Montréal-based companies. Energy-efficient buildings constitute a growing area of interest, driven by research on nanomaterials. Smart windows – that’s to say glass surfaces capable of controlling light and thus regulating the transmission of energy – could become essential components in the development of tomorrow’s buildings; these windows reduce the energy consumed by heating and air conditioning systems while regulating the level of illumination. In a variable climate like that of Montréal, for example, they could be used to limit the use of air conditioning during the summer and heating during the winter, without sacrificing comfort and quality of life. The work carried out by Professor Ludvik Martinu of Polytechnique Montréal’s Functional Coating and Surface Engineering Laboratory (FCSELS) comes under this general research thrust. The researcher and his team have developed processes and advanced nanomaterials with made-to-measure multifunctional characteristics. In concrete terms, these smart materials feature a microstructure controlled on the nanometre scale, which gives them the capacity to change colour when an electrical current is applied (electrochromic effect) or when they are subject a certain temperature (thermochromic effect). These nanomaterials are being used to develop applications in multiple fields, including smart windows, which can regulate the heat within a building or inside a means of transportation, such as a car, train or airplane. Thanks to the materials developed, these windows would be more energy-efficient and durable while retaining their aesthetic quality (custom colour and appearance), and offering increased functionalities (air purification). As well, the materials developed could be applied over a plastic film to line conventional windows and thus convert them into smart windows. Finally, it is interesting to note that these materials provide for applications in many other sectors, including aeronautics, health and safety, and biomedical science. Developing nanomaterials and green technologies for purposes of energy storage is the central objective of the research undertaken by Professor Clara Santato, who works with several research groups affiliated with the École Polytechnique de Montréal. In particular, she is studying naturally occurring molecular nanomaterials, such as thin coats of melanins, a class of biopolymers responsible for skin coloration. Melanins are supple, biodegradable and biocompatible materials with redox properties (electronic transfer) and the capacity to reversibly bind with cations. The professor and her team were able to leverage the pseudocapacitative properties of these pigments to develop an electrochemical energy storage system that is less toxic for the environment. Using biodegradable and flexible substrates, they developed supercapacitors made from melanin electrodes on carbon paper and aqueous electrolytes. These natural nanomaterials have the potential to revolutionize several technologies, notably those used in batteries and green electronics. The development of “ubiquitous sensor networks” in our cities will also depend on our capacity to produce electroactive materials that are compatible with the environment. Nanotechnologies have already had a profound impact on such sectors as medicine, biology and electronics, and they promise to generate ground-breaking technological advances in strategic fields. In particular, thanks to their potentialities, nanomaterials are blazing the path to progress in the energy and environmental sectors. Nanotechnologies are contributing to the development of electric and hybrid vehicles thanks to the emergence more efficient batteries, and they’re also playing a pivotal part in technologies aimed at optimizing and broadening soil remediation processes, and regulating energy consumption in buildings. This fast-growing sector is of strategic importance to Montréal, where the development of green technologies is the driving force behind an emerging business hub. The boom in research on advanced, economically viable materials that integrate renewable energies is sure to constitute a net advantage for Quebec’s metropolis.